If you think building a successful technology product is hard, try organizational change. Shifting culture involves people, and people are complex creatures (I can say that being one myself, and having helped create a few others), which is why most change efforts fail to deliver on their promises. Traditional upfront planning approaches don’t incorporate enough learning and fail to adapt to what is needed. Lean Change applies the concepts of Lean Startup to Change programs. Lean Startup is a learning engine, applying principles and scientific methods to uncover faster what works and what doesn’t. Using Lean Startup, we can begin with a Plan A for the organization context (market) and then test it rigorously until we come up with an approach that can stick/grow effectively in a way that creates a sustainable change program. 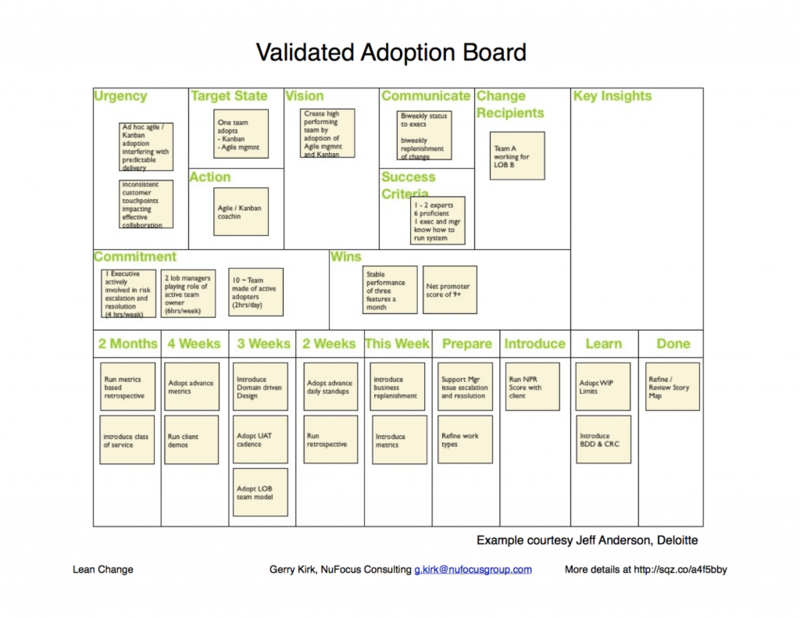 Jeff Anderson and his Deloitte team are the pioneers of Lean Change, and fortunately for us they write prolifically about it on their blog. Read about Lean Change on their Lean Transformation blog. If you attended my session at SDEC, you’ll know that I recommended getting started with Lean Change by creating a Validated Adoption Board, which consists of a MVC (Minimum Viable Change) Canvas, and the planned steps to carry one out, like the one below (click image to enlarge). If you didn’t attend the session, Jeff has a detailed post on these concepts. What are your thoughts about Lean Change? Are you interested/ready to try some experiments? Do you think Lean Change is just more buzzwords that will sell more consulting gigs? Join the conversation by adding a comment below. The idea that learning and customer feedback are crucial for startups is at the core of the The Lean Startup approach. What matters is not how fast you grow, but how fast you learn and adapt to the real needs of the customer. Validated learning and innovation accounting – two of the five pillars of The Lean Startup approach – emphasize the importance of being open for the novelty of feedback, being able to rapidly change direction, and having the inner drive for discovery.